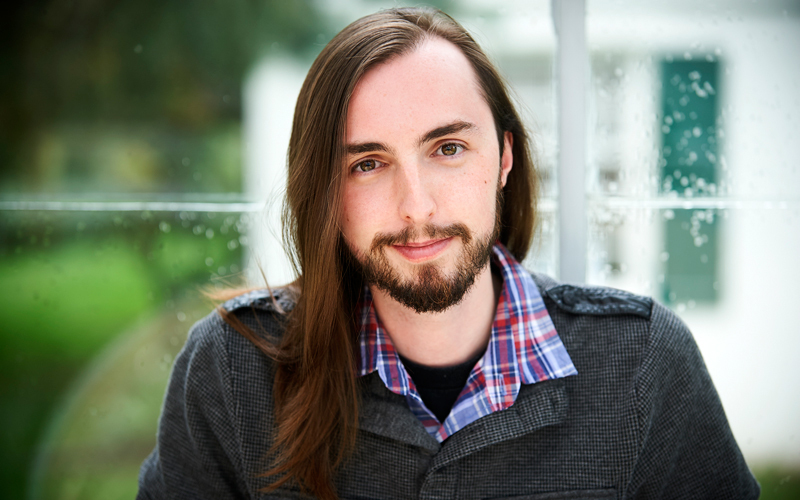 We’re spotlighting some of the successful alumni who’ve come through our doors, including the award-winning composer-alumnus (2016) Spencer Creaghan. He is also an orchestrator, songwriter and producer whose work spans film, theatre, web series, video games, advertisements, film company bumper-logos and even a children’s theme park. Creaghan’s compositions can be heard onscreen this summer – Composer Chair Lesley Barber brought him to work with her on the Sundance hit comedy, Late Night, starring Mindy Kaling and Emma Thompson. He also is fresh off composing for Jean-Claude Van Damme’s Black Water, and a win at the 2018 SOCAN Foundation Awards for Emerging Audio-Visual Composers, where he won first place for Best Original Score (The Ballad) and second place for Best Original Score-Non Fiction (Sonoris). Indeed, Creaghan is no stranger to SOCAN wins, having achieved success in categories as diverse as documentary, animation and live-action films in previous years. Earlier credits include his music for the Toronto International Film Festival’s (TIFF) Canada Top Ten film, Cupid (2016); the Cannes Film Festival short, Legs (2013); and his orchestration for pop and heavy metal artists like Lindsay Schoolcraft, Devilment and Mirellia. Below, we spoke with him about the impact of his time and work in the Slaight Music Residency. Honestly, my biggest takeaway was seeing how closely knit the film world is, in the best way. We all work together, we’re all striving to make great art, and we can each have successful careers. I saw people lift each other up during that journey. It’s something that can get lost in outside discussions about the film world, leading to jaded perspectives on our industry – a view I find misguided. What I saw in the Slaight Music Residency countered this cynicism. I saw mentors, apprentices, alumni, large crews, casts, post-production teams and producers all come together to create films in the way that a village builds a town. That’s something you don’t easily let go of. Absolutely! I’ve been fortunate to hold onto many relationships that I forged during my time at the CFC. From my own experience and others, your core family are those in the same program. Thus, my fellow composers and I became incredibly close during the program. Both during it and after, we have given each other tips; we’d record and write together; we’d share projects and continually collaborate. Beyond the Residency, I’ve also been fortunate that many of the connections I made in the program have led to successful collaborations since graduating. My Slaight music family (Aimee Bessada, Rebecca Everett, Neil Haverty and Chris Reineck) and I just finished two feature films with producer Ali Mashayekhi’s Without A Flock vignette series (Mashayekhi is a Producers’ Lab alumnus as well). Also in the near future is an incredible feature being developed by writer Jesse Harley, based on something we did together at the CFC – it’s awesome and monstrous! None of these connections could have existed without me spending time working at the CFC. What’s great about the program is how well it matches us creative types with those who share our similar visions and processes. That creates strong ongoing bonds. What types or styles of music do you gravitate towards when composing for on screen? How did that evolve since coming through the Slaight Music Residency? I am perhaps most known as the orchestral guy or more traditional film composer type, but since coming to the CFC, my style has evolved. Now, I emphasize finding strange instruments, electronics, and playing with found sounds, as much as the use of the orchestra. The filmmakers I enjoyed working with still put great emphasis on the “music as a character” role of a film, but there is a subtlety to the music now that wasn’t there before. I am still the narrative composer I was before, grabbing onto a character’s memories, subconscious, and deep thoughts to connect the score to its film’s emotional arc, but the CFC helped me refine how to narrow in on these specific beats more than before. Through the Residency, I was fortunate enough to be taken under the wing of esteemed Canadian composer Lesley Barber. She’s brought me on to help score several films in the past few years, most recently being the Mindy Kaling-Emma Thomas comedy, Late Night due out in June. We’ve also worked together on the films, Boarding School, Irreplaceable You, and the forthcoming American Woman. I’m currently working on a few films with fellow CFC alumnus Dan Abramovici, from the CBC Actors Conservatory. I am also beginning early writing for a feature film produced by Heidi Tan from the CFC’s Cineplex Film Program Producers’ Lab. Aside from film, I also compose grand orchestral accompaniments for heavy metal bands. I’m working on several albums right now for these bands. I’m also composing and producing a globe-trotting folk album that is taking myself and co-producer Armenia Sarkissian around the world, recording with great musicians and orchestras from a myriad of cultures. I’m most looking forward to getting into these recordings and diving into some new films on the horizon! What do you have your eye on? What is exciting you about the industry right now? Anything from new sounds to instruments, interesting advancements or tools to new trends or styles? The industry is in a period of transition. Honestly, it’s quite exciting! Streaming changed the game, which has led to countless projects being in development – which even more of us Canadians can be a part of! I recently read that Netflix is opening a new production space in Toronto. Apple is getting into the streaming game, and CBC Gem opened its doors not too long ago. With so many stories being told, it’s hard not to be excited about the future. Also, the National Association of Music Merchants (NAMM)announced MIDI 2 just this January, which includes a way to record software instruments through the human voice – that is just mind-blowing! I recently saw a film in ScreenX a few weeks back. While it had a few kinks, I said to my buddy, “Give this five years and it will be the next big thing!” My money’s on Avatar 3 or 4 or whatever is implementing the tech perfectly then. What content are you recommending right now to your friends? Anything you are watching, listening to, reading etc. that got you excited! As my friends will tell you, I am a big fan of Scandinavian entertainment. Woman At War, Border and Blindspot were highlights of TIFF last year, from Iceland, Sweden and Norway respectively. I just finished Finland’s Deadwind, which was fantastic and I am now onto another Finnish drama, Bordertown. Keeping to those icy Viking countries, I’ve been listening to quite a bit of Norse folk music through artists Einar Selvig, Myrkur, Ivar Bjørnson, Garmarna and Eivør. There’s something about their music that is as powerful and hopeful as it is tragic. You can just feel the ice mountains and volcanos in the textures. Somehow, they’re advancing how the orchestra is used. It’s inspiring to hear! On the indie side of things, it turns out that the Toronto Public Library connects to an incredible streaming service. Kanopy, which has a ton of indie films, international films, and Canadian films that are hard to find anywhere else. I’ve been recommending these to many of my friends and colleagues who are looking for something a little different!